B115.Bayonet SA Reichschule Feldafing with Brown Leather Frog.Maker :"J.A.Henckels-Solingen". 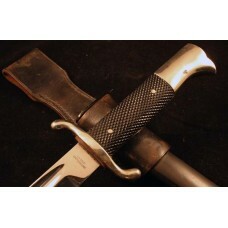 Etched..
B151.Fire Brigade Dress Bayonet with Black Leather Hanger. 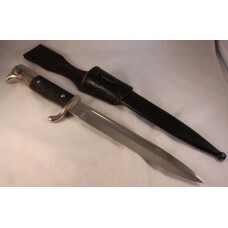 Long model and maker marked with:"A.Ziegl..
B134.Fire brigade Dress Bayonet with Leather Hanger. 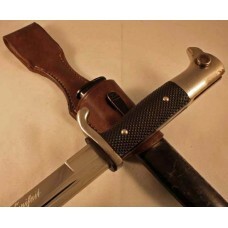 Short model maker marked:" Horst Wolff GmbH-Lei..
B150.Fire Brigade Dress bayonet, short model. Maker marked "Carl Eickhorn-Solingen". Excellent condi..